I come from a long line of artistic people and finally, at the age of 46 (and a divorce), found where my creative juices flow. I made this for a cake decorating class that I took; it was our "final". I love everything about weddings, so, my inspiration for this cake came from an "if I could do it again, only not with the 80's mentality" thought. Cakes and gowns are so elegant now and I imagined today's bride might go for something like this. Kristi, What a beautiful fondant cake! Thank you so much for entering the Wedding Cakes For You Contest! You should get an A+ for your final in your cake decorating class! Are you considering a career in Cakes? Kristi your cake is beautiful and you should definitely start this professionally,having made cakes most of my life for friends and family it is so enjoyable and I can see from your description that it truly comes out in your cake design a winner all the way. I would hire you to make a cake for me! This cake is absolutely stunning! Your cake is beautiful,love the pillow idea.Hope you get an A.
I am a man and I'm majorly impressed. I love where this is going! I am new to this site. Kristi, your cake is simply stunning. I am new to "cakes" and your cake and others I have seen here are truly inspirations to me. Keep up the fantastic work and I look forward to seeing your next work of art. By they way, how did you manage to create that "pillow"? thanks so much! for the pillow, you would ice two layers together; using a pillow as a model, carve away the cake to form the shape. drawing the shape with a knife (as you would see it from a side-view) on the side helps, too. once you figure it out (took me two tries with the help of a youtube video), all you have to worry about is how fluffy you want it, rounding edges, etc. covering it is easier than a square shape, too. Watch any show you can on cake decorating(food network challenges, ace of cakes, cake boss) and learn their techniques. have fun! Thanks Kristi for the reply..I understand now how you made the pillow, but I'm still astounded at how real it looks. Re: the tassels and rope around the pillow, is that all fondant? it is all fondant. I rolled out the two colors of fondant for the cord, and twisted them. I used a mix of gum paste and water to attach the cord and pinned it until it was set. the tassels idea came from a play-dough kit my kids used to have. What I ended up using was a garlic press. I had to stick two balls of fondant in it to get one tassel. Worked perfectly. Then, I trimmed them with scissors and attached the tassel and the balls on with melting chocolate. 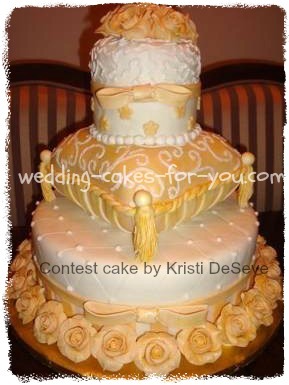 Kristi You are the winner of The Cake Decorating Contest Three at Wedding Cakes For You. I emailed you but it kept bouncing back. So you did get the A+. Can you contact me through my contact Lorelie page? I want to give you your gift coupon for $25 off of a cake stackers cake support system and I have another gift to mail to you as well. Thanks so much for your input. Great idea for the tassels..making them with a garlic press! I did think the cord was an actual "cord", not made of fondant. Truly, the work you did is "art" and you are very creative. Congratulations to you for winning this contest! Your creative work and helpful comments are great inspirations to those of us who are new to "cakes". Thanks for suggestions to watch all of the "cake", cooking shows, which I already do watch..my sons continually say: "the only stuff you watch on TV is cooking and cake shows"
I don't have very agile fingers, so I wondered if a spaghetti machine would work too? Congratulations with this cake!! Join in and write your own page! It's easy to do. How? Simply click here to return to Cake Decorating Contest 1.